1 Project for Ensminger Builder, Inc.
6 Reviews for Ensminger Builder, Inc. I am in the commercial construction business. I have over 100 employees, but when it comes to my own home, I only trust Jake to do the work. We tore off the top of my 1850's stone farmhouse roof to create a new great room in place of the attic. The crew was professional, highly skilled, and kept the project clean. I would recommend Ensminger Builders to anyone. I am planning another project, and Jake will be doing the work. They built an addition to my home, at almost every step of the way their incompetence was evident. From the start, before they even dug the basement, they had the layout 2ft off location. They needed to make the addition floor match the floor height of the existing house, when the framing was complete, the new SUB floor was 3/4" higher than the existing FINISHED floor. When this was pointed out, Ensminger said they would add plywood to the existing floor to make up the difference. They added the plywood, by only nailing around the perimeter of the boards, nothing in the middle. When I contacted Ensminger, he said they weren't finished. The very next day, they installed cabinets on the "unfinished" sub floor. We now have uneven, bulging floors, the cabinets were so crooked, the dishwasher wouldn't fit into the hole. When that was brought up, he tried to blame it on the appliance installers, when it was clear the opening was out of square and a 1/4" too small. I realize you will read this, and think I am exaggerating, I AM NOT. I wouldn't hire them to build a dog house. From framing, drywall, plumbing, and electric, each trade had to come back 3, 4, 5 times to fix their incompetence. I'm sure Ensminger will complain and try to have this review taken down. I will be more than show anyone, evidence of their incompetence. They can't even install a door so the latches latch. It's unfortunate that this venue allows people to vent personality conflicts. I am a 46 year career professional. My Mother taught me "If you don't have anything nice to say don't say anything". That's just bad manners. I can say with a clear conscience that much of what Mr. Hartman said is simply not true. I want to thank Mr. Hartman for making the point that we do return without questions even for people that have no respect or understanding of this trade. There is always two sides to a story! Our goal is to complete all projects to the satisfaction of our customers. We are very fortunate to have many more satisfied customers than NOT. I provide a very complete yet easy to understand contract that protects my customer. Most people feel safe and confident in our working relationship. Incidentally, Mr. Hartman hired my "incompetent" subcontractors right after we completed his project. Ensminger provided estimate for replacement of 2nd floor deck and concrete work below. We paid for fiberglass fluted columns with decorative top and bottom pieces. He was told we wanted flooring that did not show nails or screw holes. He put down flooring with nail holes. The floor joists were composite material not suitable for outside use and he put rubber inner tube material over the top to help with moisture. Soon they rotted with huge mushroom growths coming out of them as they split apart. The nice fluted columns were installed without anything inside them and within a few years they were bending. Needless to say - no permit was obtained. The deck eventually fell. This was $25,000+ job. When bill was paid in full - he pressured us to pay another $800 because of "difficult job". Shameful workmanship and business practices. At Ensminger Builder we start out doing our best. We work with the owner's budget, material selections and personalities. We want what they want - a job well done! A job they can brag about and a job we can use as a reference. It truly troubles me when a customer has any concern at the end of a completed project. It is a fact that in 42 years of business we have had only a hand full of concerns. Whenever I am made aware of a concern, I address it. Building is an evolving industry, with a steady stream of new products and installation methods arriving every day. The product used at the time of this particular installation was new technology - it has been greatly improved since. The application was completed according to the manufacturer's instruction. Hidden fasteners were used when possible, the only exception being at starting and stopping points. The rubber, to which this customer refers, was used to protect the top of the floor joist. Any mold or mushroom growth is due to lack of care. All materials need to be cleaned once a year, more if in a damp low-light area. It is not possible that the deck could have fallen down. Parts may have come loose, but the deck could not have fallen off the building. We are always available for follow-up with our customers. Any additional costs would be a result of change orders requested by the owner after the initial contract agreement. This customer has chosen, not only once, but twice to complain about the same concerns. Many of the facts are wrong including the original installation date. The project was completed 11 years ago. There has been no call to address the concerns directly with me. Instead, this customer has chosen to address the disappointment in a public forum. I take personal pride in returning to meet with customers as many times as necessary to respond to their concerns and questions. Sometimes products fail. Occasionally, a mechanic will have a bad day. Forty-two years of success in the building business means I take care of things like that. I encourage all of my customers to contact me directly about their concerns, and I take extra care to address them. 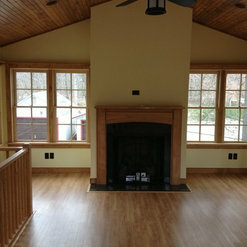 Please take the time to visit my website at www.ensmingerbuilder.com or call me at 717.520.0882. Customer satisfaction is the most important outcome for ALL of our customers. Fantastic oversight and coordination of the project. Hires only qualified workers and despite obstacles, gets the job and the detail work done. Recommend highly. Finished off a basement with bathroom, office, kitchenette, large family room, and fireplace. Fairly good experience, but used a sub-par drywaller and stood behind their work which was very frustrating. I brought in a great drywaller and deducted his bill from the cost of the job, but contractor was not happy with that solution. They did exceptional work, were prompt, respectful and thorough. Their carpenter did custon fitting for everything that he worked on which was essential for our older home. The contractor recommended and worked with other professionals whose work was exemplary. Ensminger checked in with us several times a week which was really appreciated.